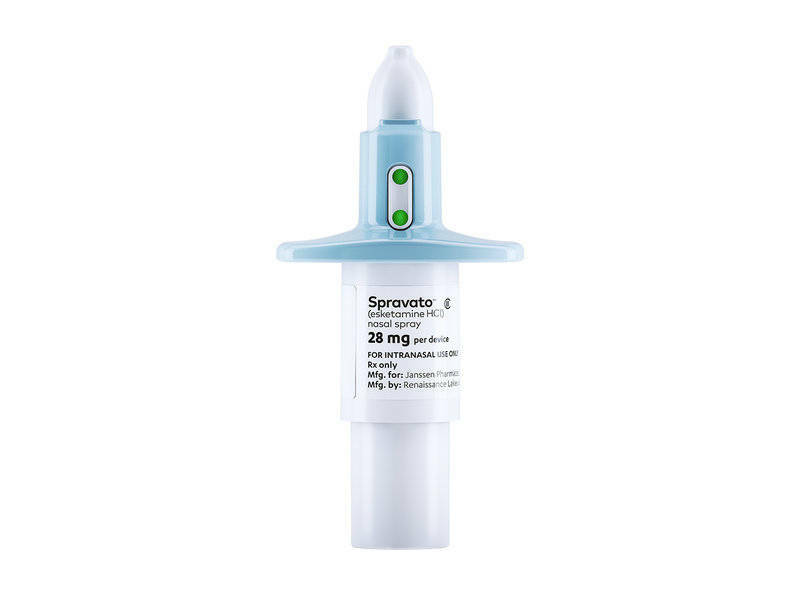 Esketamine — developed by Johnson & Johnson and delivered as a nasal spray — was tested in combination with oral antidepressants in patients with what’s known as treatment-resistant depression. The drug is related to ketamine, a common anesthetic that’s sometimes misused recreationally. Many experts have hailed esketamine as a critical option for patients in dire need of new treatments — particularly because it might work faster than existing antidepressants. “The unmet need is really huge,” said Dr. Husseini Manji, the global head of neuroscience therapeutics at Janssen, the subsidiary of Johnson & Johnson that developed the drug, which will be called Spravato. Janssen said the cost of the treatment will depend on the dose used per session and how many sessions a person will need, both of which can vary. The wholesale acquisition cost: between $590 and $885 per treatment session. That means the wholesale acquisition cost for the first month of treatment — which includes two sessions a week — will range from $4,720 to $6,785. But an approval — and subsequently, anticipated insurance coverage for esketamine — is welcome news for the growing number of patients who have paid thousands of dollars out of pocket in recent years to receive off-label infusions of ketamine as a treatment for depression. The drug’s labeling will include a warning that patients who take esketamine are at risk for sedation and issues with attention, judgement, and thinking. It will also warn that there is a risk of misuse, abuse, and suicidal thoughts after taking esketamine. Patients who receive the drug will have to be monitored for at least two hours every time they get esketamine. Johnson & Johnson submitted five Phase 3 studies on the drug: three-short term studies, one maintenance study, and a long-term safety study. Aside from the safety study, two of those turned up positive, clinically significant results. One was a randomized trial in adults under age 65 with treatment-resistant depression who were started on an oral antidepressant and esketamine. After a month, roughly 70 percent of patients who received the treatment responded, compared to just over half in a placebo group. An improvement of 50 percent or more on a common depression rating scale was seen as a successful response. The other positive study was a maintenance-of-effect study, in which participants who responded to esketamine in one of the short-term studies were randomly assigned to either keep taking it or be switched to a placebo. The FDA generally wants to see two successful studies for approval — but historically, withdrawal studies haven’t counted toward that total. But the FDA said the evidence — and input from external advisers — played a role in the decision to approve the drug. “Controlled clinical trials that studied the safety and efficacy of this drug, along with careful review through the FDA’s drug approval process including a robust discussion with our external advisory committees, were important to our decision to approve this treatment,” Dr. Tiffany Farchione, acting director of the Division of Psychiatry Products in the FDA’s Center for Drug Evaluation and Research, said in a statement. Not all experts are convinced there was enough data to approve esketamine yet. “The threshold has been two adequate and well-controlled trials. In this case, they only got one,” Dr. Erick Turner, a psychiatrist at Oregon Health and Science University, told STAT in an interview last month. Turner serves on the FDA advisory committee that recommended last month that the FDA approve esketamine, but didn’t take part in that meeting. The committee emphasized the need for a robust strategy to prevent diversion and misuse, given that ketamine is commonly abused. Ketamine is a combination of two enantiomers, or mirror image molecules. Esketamine is what’s known as the s-enantiomer. But the experts generally agreed that the risk of abuse with esketamine seems to be low. “There will be all kinds of monitoring to make sure the drug doesn’t get diverted,” Manji said. That includes strict distribution requirements and a suspicious order monitoring program. Johnson & Johnson is also testing esketamine as a treatment for people with depression who are at risk of suicide, and is expected to release results from a study on suicidal patients this year. Allergan is also in the late stages of testing an experimental, fast-acting antidepressant called rapastinel. An Allergan spokesperson said that the company anticipates that the need to monitor patients and restrict activities after rapastinel will be “minimal” compared to the requirements for esketamine. The company also said there seems to be a lower rate of dissociative effects with rapastinel. The drug is being tested alone, in combination with other treatments for major depression, and in patients with depression who are at risk of suicide.